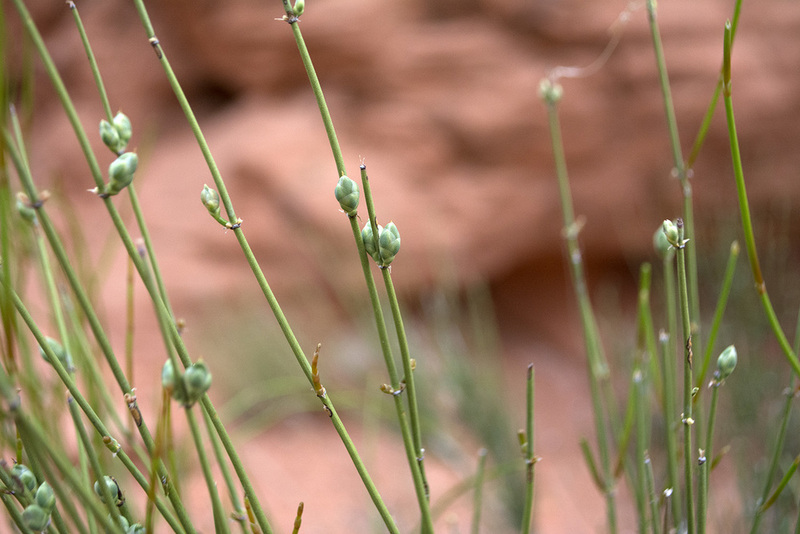 MY FIRST REAL EXPOSURE TO THE SOUTHWESTERN DESERT WAS ON THE DRIVE TO VALLEY OF FIRE STATE PARK. IN ORDER TO SKIP A SEVERAL HOUR CAR RIDE BACK TOWARDS VEGAS AND THEN UP AND OVER TO VALLEY OF FIRE, WE CUT THROUGH LAKE MEAD NATIONAL RECREATION AREA ALONG LAKESHORE ROAD. WE HAD VIEWS OF LAKE MEAD ON OUR RIGHT AS WE COASTED THROUGH THE FIRST LEG OF THE DRIVE. IT WAS AT THIS POINT I BEGAN NUDGING DAVE TO STOP SO I COULD GET SOME PHOTOS. WE STOPPED VERY OFTEN, BUT I WAS SO OVERWHELMED WITH MY SURROUNDINGS I COULDN'T HELP IT. EACH VIEW WAS MORE STUNNING THAN THE NEXT. I'M GRATEFUL WE STOPPED WHEN WE DID BECAUSE IT WAS ALONG NV-167 I SNAPPED ONE OF MY FAVORITE PHOTOS OF THE TRIP. WE PAUSED TO LOOK OUT AT A NEARBY RIDGE WHEN A COUPLE PULLED UP AHEAD OF US TO DO THE SAME. I WAS MESSING WITH MY TRIPOD WHEN I NOTICED HOW PERFECT THEY'D ALIGNED THEMSELVES FOR A PHOTO. I SNAPPED A COUPLE QUICKLY AND THEY DROVE OFF. IT'S A LONG DRIVE ALONG NV-167 AND WE TINKERED ON RUNNING OUT OF GAS IN THE MIDDLE OF THE DESERT. LUCKILY, WE MADE IT TO A GAS STATION JUST PAST THE ENTRANCE OF THE PARK, RE-FUELED AND PICKED UP FIREWOOD FOR THE EVENING AHEAD. THE CONSTANT LANDSCAPE CHANGES WERE SIMPLY INCREDIBLE. 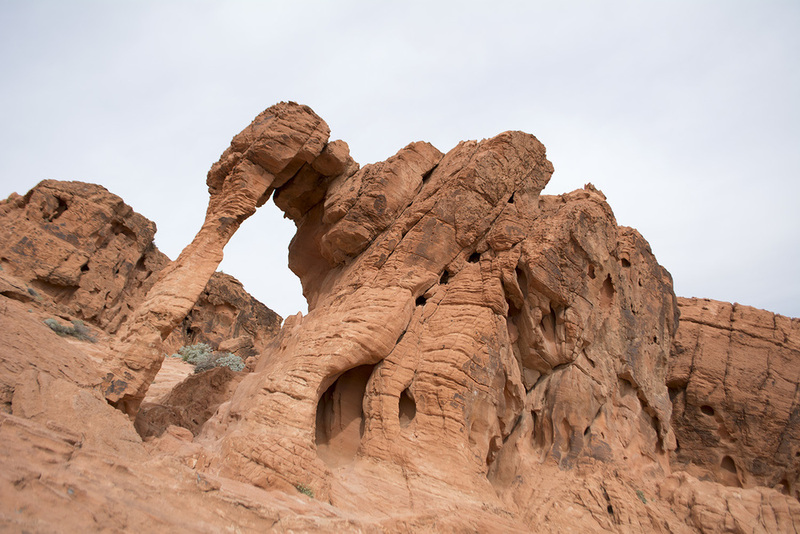 ONCE WE TURNED INTO VALLEY OF FIRE STATE PARK, IT WAS LIKE WE'D LANDED ON MARS. ALL OF THE SCENERY PRIOR WAS DRY, HEAT DRIVEN DESERT. ONCE INSIDE VALLEY OF FIRE, EVERYTHING WAS SUPER SATURATED IN RED-ORANGE COLOR. CRATERS AND WHAT LOOKED LIKE PETRIFIED GEMSTONES COVERED THE PARK IN EVERY DIRECTION. THE ORANGE ROCK FACE NATURALLY COMPLIMENTED THE VIBRANT BLUE SKY. THERE WERE POINTS WHERE THE ROAD SEEMED TO GO ON FOREVER AND OTHERS WHEN GIGANTIC ROCK SHOT STRAIGHT OUT OF THE GROUND DEMANDING YOU TO STARE AT THE HORIZON. WE FOUND A CAMPING SPOT IN ARCH ROCK CAMPGROUND, DESPITE THE LOT FULL SIGN. WE SET UP CAMP, SETTLED IN AND SHORTLY AFTER MADE FRIENDS WITH NEARBY CAMPERS. DAVE WAS ABLE TO PREP OUR DINNER THE NIGHT BEFORE THANKS TO THE KITCHEN IN OUR STUDIO HOTEL AT THE PALMS. WE HAD TAKEN A TRIP TO WALMART AS SOON AS WE ARRIVED IN VEGAS TO BUY ALL OF THE SNACKS AND FOOD NEEDED FOR THE NIGHTS WE CAMPED. WE WOLFED DOWN CHICKEN, PEPPERS AND GARLIC MASHED POTATOES AND A COUPLE GLASSES OF WINE. WE WOKE UP TO THE PRETTIEST SUNRISE BEHIND THE RED ROCK THAT ENCASED OUR CAMPSITE. I TOOK A WALK TO TAKE SOME PHOTOS WHILE DAVE PREPPED THE FIRE FOR BREAKFAST. HE MANNED THE BACON AND EGGS IN OUR CAST IRON WHILE I WHIPPED UP BLUEBERRY PANCAKES. 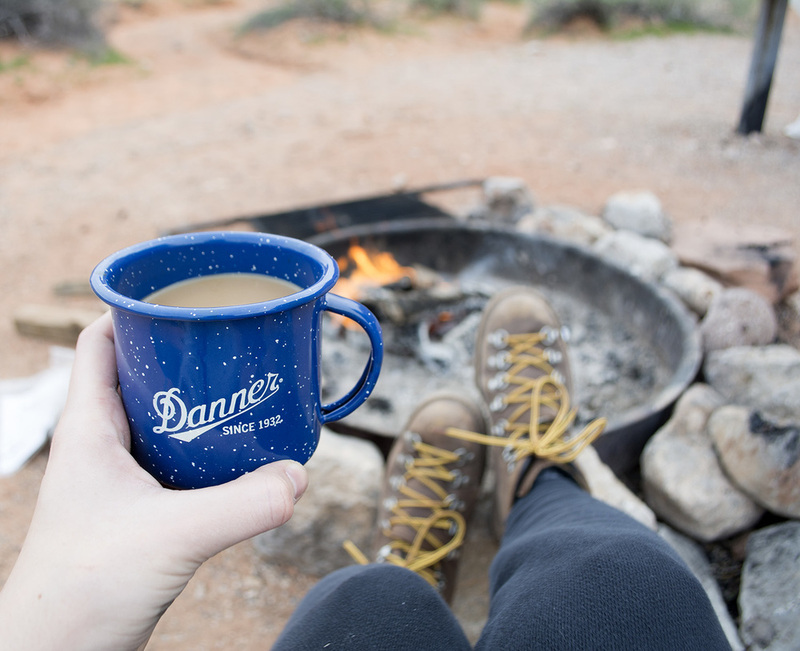 THERE'S NOTHING BETTER THAN A HOT CUP OF COFFEE AND A CAMPFIRE BREAKFAST TO EASE YOU INTO THE DAY. ONE OF THE BEST PIECES OF EQUIPMENT I HAVE ARE DANNER BOOTS. THEY'RE THE HIGHEST QUALITY LEATHER GOOD I'VE EVER OWNED. COMFORT AND DURABILITY ARE KEY IN OUTDOOR ACTIVITY AND THESE BABIES ARE THE KING OF BOTH CATEGORIES. I LIKE THAT I CAN WEAR THEM IN ANY HOT OR COLD SITUATION, WHICH MAKES PACKING EASY. THIS TRIP ALONE WE SAW TEMPS AS HIGH AS 80'S/LOW AS 30'S AS WELL AS VERY MIXED TERRAIN AND MY FEET WERE CONSISTENTLY COMFORTABLE. THERE WERE A COUPLE SPOTS WITHIN VALLEY OF FIRE I WANTED TO CHECK OUT, SO AFTER BREAKFAST WE PACKED UP OUR CAMPSITE AND HEADED OUT TOWARDS ELEPHANT ROCK , ARCH ROCK AND MOUSE'S TANK TRAIL. ARCH ROCK IS VIRTUALLY AT THE ENTRANCE OF ARCH ROCK CAMPGROUND, SO I WAS ABLE TO CATCH THE SUNRISE THERE. AND BOTH ELEPHANT ROCK AND MOUSES'S TANK TRAIL ARE SHORT HIKES THAT YOU CAN PICK UP LONGER TRAILS FROM. WE CHOSE THE EASY TRAILS FOR TIME SAKE SINCE WE PLANNED TO ARRIVE IN ZION BY THE AFTERNOON. VALLEY OF FIRE STATE PARK COMPLETELY BLEW MY MIND. I WOULD HAVE WANTED TO SPEND A BIT MORE TIME EXPLORING, BUT WE DID WHAT WE COULD WITH THE TIME ALLOTTED. BEFORE WE'D EVEN LEFT, WE DECIDED WE'D BE BACK.